Diminishing Returns: The state of Nebraska’s National Prestige. 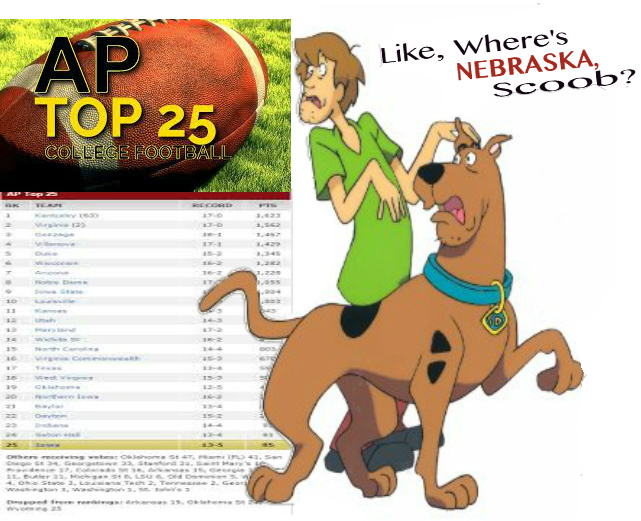 You may have noticed something curious with the latest AP poll in regard to Nebraska. Since dropping a heartbreaker to BYU two weeks ago and looking quite polished against South Alabama (in a week in which many schools up and down the AP Top 25 struggled mightily against lesser competition) Nebraska has failed to collect a single vote from any AP voter. In the meantime, the Comeback Cougars have climbed steadily up the AP ladder with dramatic wins over both Nebraska and Boise State. BYU currently sits at #19. And, as well they should. Both victories were hard-fought and gutsy. But when you add up the number of teams ranked below BYU along with those unranked schools receiving votes, you find a whopping 26 football teams. Granted, it’s merely Week 2. There are plenty of undefeated teams out there for voters to consider before factoring in the 1-loss teams. But when a team has another team dead to rights for the win and only gives up the victory on a last second miracle, shouldn’t that losing team at least get a look from the voters as being in the same general ball park as the winner? Instead of wedging 26 friggin’ teams between them? Maybe it’s just me… Call me crazy. It was such an amazing run of national relevance and esteem for Nebraska that, when the Huskers’ remarkable high-level consistency came crashing down with the 7-7 season of 2002, the Los Angeles Times sports page ran an article with the following gist: There was no surprise that Nebraska suffered a slump that year. The surprise was — why did it take so long? The article went on to detail the amazing level of performance sustained by Bob Devaney and Tom Osborne and then, briefly, by Frank Solich. It was a nice bit of Chicken-Soup-For-the-Soul for a Nebraska kid living in LA and suffering through what I’d hoped would only be a temporary downturn for the Huskers. Twelve seasons later, we’re all still waiting for a full recovery. While only two subsequent seasons have been worse than 2002, Nebraska has failed to reach the 11-win mark even once since then. By comparison, Nebraska racked up twelve such 11-win seasons in the 31-year span from 1970 to 2001. And those were mostly done in years in which Nebraska played just 12 games in total. Not up to 14 like they do now. Nebraska’s string of success during the Devaney/Osborne/Solich years was a remarkable feat contributed to by an array of ingredients — great coaching; high-level recruiting; low coaching staff turnover; a pioneering strength and conditioning program; and a passion-fueled walk-on program like no school has seen before or since. But one has to wonder how much of “getting the benefit of the doubt” by the national sports media also contributed to Nebraska’s success. Looking back over Nebraska’s rankings compared to teams with similar records reveals just how far Nebraska has dropped in national prestige over the last 13 years. Entering the 1970s with back-to-back National Titles, Nebraska saw teams with equal-or-worse records ranked ahead of them eight times in the final AP polls. On the flip side, the Huskers themselves were ranked higher than 51 other teams with the same or better records over the course of that decade. In the 1980s, that trend continued with Nebraska finishing the seasons of 1980 through 1987 behind only seven teams with identical or worse records, while finishing ahead of 28 with identical or better records. Then the late-1980s/early-1990s hit the Tom Osborne era. This was that brief tumultuous period in Osborne’s career when the Huskers suffered a string of seven consecutive bowl losses and were regularly torched by the speed demons at Florida State and Miami and saw Colorado leap ahead as the Big 8’s heavy just as Oklahoma had started to slip. The national perception of Nebraska football from around 1988 through 1992 was that it had become a paper tiger under Osborne. That his teams would always be good for nine to ten wins thanks to a conference slate that wasn’t exactly a murderer’s row of competition. From 1988 to 1992, Nebraska saw its final AP ranking higher than teams with equal or better records ten times. Not too shabby, right? Fairly respectable, sure. Until you realize that 27 teams over that same five-season span with the same or worse records finished ranked above Nebraska. The Huskers were no longer getting the benefit of the doubt. To encapsulate all this data, the eighteen seasons from 1970 through 1987 saw the national media rank the Huskers ahead of all teams with equal or as good of resumes 84% of the time. During Osborne’s “dark period,” that percentage dropped to just 27%. Let me tell you, an 84% benefit of the doubt ratio is as good as what the SEC Conference enjoys in the same category even today. And, as we all know, that ratio is pretty ridiculous. The success of the Huskers from 1993 to 2001 catapulted Nebraska’s prestige ratio back up for a good decade run. But, since then, it’s gotten pretty grim. So far this decade, Nebraska has finished in the AP poll higher than a team with an equal or better record just once. Meanwhile, 17 teams with equal or worse records have landed higher on the final tally than Nebraska. That’s about a 5% benefit of the doubt ratio. Over Bo Pelini’s entire run in Lincoln, his teams have finished better than five teams with equal or better records while landing lower than 25 teams with equal or worse resumes. A 17% ratio, that bump up from 5% is entirely attributable to Ndamukong Suh. Now, one might argue, “So what?” You win, people give you the benefit of the doubt. You lose, people don’t. So winning takes care of the problem, right? The short answer is, yes. But there’s more to it than just that. Let’s take a look at the SEC’s string of seven consecutive BCS Titles. Before Florida State and Ohio State came along to put a cork in it, SEC Conference honks were wondering out loud — and in all seriousness — whether or not a non-SEC team would ever win a National Title ever again. Outside of a return by Pete Carroll to USC, these blowhards could not imagine a scenario in which the SEC’s BCS Championship streak ended. As they saw it, every year the SEC Champion was a defacto place-holder for at least one spot in the BCS Championship Game. And, whomever landed in the other spot simply could never be good enough to defeat the SEC Champion (unless that team is another SEC team, ala the 2011 season). Therefore, the string of BCS Champions from the SEC would continue again and again in the same way, forever. Ad infinitum. Jameis Winston and Florida State became the St. George who slew that dragon. But even then, the SEC supremacists rationalized that it took a program which essentially exits in the heart of SEC territory and amid the fertile SEC recruiting ground to do it. In other words, only a defacto SEC team like Florida State was capable of stealing a title from the SEC trophy corral. But how did the SEC’s streak happen? From 2006 to 2012, four different SEC schools produced seven consecutive National Titles. To do that, those schools had to win all seven of the final match-ups, which they did. And the rest of the world should salute that feat. But the question is, should every single one of those BCS championship games even have had an SEC team playing in them? In some cases, the answer is yes. In 2010, 2011* and 2012, no non-SEC school had equal or better records than the SEC schools who made the cut. The one caveat for 2011, is that there were two SEC schools in the BCS Championship. 13-0 LSU was the only undefeated team in the country and the only obvious participant that year. But the other SEC team, 11-1 Alabama, had an equal record to three other teams from outside the SEC — Oklahoma State, Stanford and Boise State. Was Alabama the best team of 2011? Probably. The Crimson Tide soundly defeated LSU in a rematch. The question is, was it fair to block from the BCS Title game three other teams with identical records to Alabama based solely on assumptions? After all, Alabama already had their shot at LSU during the regular season and they lost. Rematches between two evenly matched opponents rarely go well for the team that won the first round. The BCS committee essentially handed Alabama a trophy, despite the Tide’s lack of even a divisional conference crown. But there’s no guarantee that one of the other 11-1 teams couldn’t have also defeated LSU. Alabama got the benefit of the doubt, much to the distaste of most every fan outside the SEC. And so did most of the other SEC representatives in BCS Title of the last eight years. Consider the pool from which those teams were selected. Adding in the 2013 season — when Auburn played in the BCS title game, but lost — a total of 35 football teams had resumes worthy of consideration for a championship berth going back to 2006. Only nine SEC schools were in the mix. But, when it came time for selection, all nine SEC schools were taken along with only seven non-SEC schools, leaving 19 non-SEC football teams on the outside looking in. That’s nine SEC teams in eight BCS Title games compared to just two for the Big 10, two for the Big 12, one for the Pac 12, one for the ACC and one independent. Enter the College Football Playoff and the Ohio State Buckeyes. The new playoff system had SEC honks salivating. How many all-SEC championship games would they get to see in the coming years? Could the SEC land three teams in the four-team playoff, instead of what would surely be their usual two? What about all four spots? Could that also be on the menu? If you think I’m exaggerating, go into the archives of any national college football message board from about two years ago and you will see these scenarios suggested and debated. And without any reticence. But the launching of the 4-team playoff produced, without question, a national champion that would not have existed were it not for the change in the system. Had the BCS Series method still been in play in 2014, we would have seen a match between 12-1 Alabama and 13-0 Florida State. Based on the results shown in the actual 4-team Playoff, the most likely outcome is that Alabama would have beaten the Seminoles — and re-tracked the SEC National Title-winning locomotive by defeating the very team that derailed it the year before. Meanwhile, Ohio State, which tore through its three post-season matches like the Mongol Horde ransacking Anatolia, would’ve shown up in some unmemorable BCS Bowl consolation game. Probably against Oregon in the Rose Bowl. Which, if I’m not mistaken, would’ve been something like a 42-20 win for the Buckeyes. Good enough for maybe a third place finish in the final polls. The Playoffs clearly now make it harder for teams to win Championships with the aid of mere assumptions. That aspect will still come in to play when figuring out who should fill the four playoff spots each year. Without Ohio State’s 59-0 demolition of Wisconsin in the Big 10 Championship game, the eventual 2014 National Champions would’ve been left out of the tournament in favor of either Baylor or TCU. Seeing ten SEC schools land in the AP Top 25 for the second poll of the 2015 season clearly illustrates that the Southeastern Conference remains the darlings of the media. Gray area still exits. And that’s why Mike Riley needs to repair Nebraska’s national reputation as soon as possible. A 12-1 season might not be good enough to land Nebraska a playoff spot in this day in age. We’ve seen two dozen teams over the last decade who can attest to what that feels like. But, beyond worrying about the pinnacle (which Nebraska is in no current contention for), rankings matter. Having a number next to your school’s name determines how much national press the football team gets. How much exposure to potential recruits your program receives. ESPN’s pumping up of SEC schools (never mind the conflict of interest with its TV contract) inflates the value of those teams, who are then ranked higher by the national media, who then receive more attention, who then reel in better recruits, who then win more games, who then get more and more benefit of the doubt. It must be nice, huh? Well, once upon a time, that was Nebraska’s luxury, too. Quick trivia question: Name the only two college football teams to win National Titles in the AP era with two losses on their records. If you said 1960 Minnesota and 2007 LSU, give yourself a cigar. But did you know there was almost a third such team? Indeed. 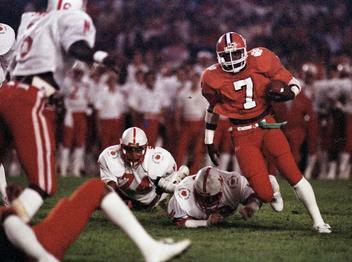 On January 1, 1982, #1 and undefeated Clemson arrived at the Orange Bowl to take on the Big 8 Champion — 9-2 Nebraska, who held a #4 AP ranking. Between them sat #2 Georgia and #3 Alabama. Soon after the Huskers and Tigers kicked off, Bama and the Bulldogs took turns losing in the Cotton and Sugar Bowls, setting the stage for an outright National Title match in Miami. Clemson jumped out to a 22-7 lead by the end of the third quarter, thanks to a pair of costly Husker fumbles. But, on the legs of Husker legend, Roger Craig, Nebraska mounted a comeback, picking up a 26-yard touchdown run midway through the final period. A two-point conversion put the Huskers within seven with almost eight minutes left on the clock. Nebraska got two more shots after stuffing Clemson’s subsequent drives, only to see its comeback fall short with a final desperation heave toward the end zone in the waning seconds. But, had Nebraska completed the comeback, the Huskers would have collected their third National Title with a 10-2 record. A claim Nebraska would’ve had while sitting above a whopping nine teams with equal or better records. Including a would-be 11-1 Clemson. Yep, getting the benefit of the doubt in college football is no easy task. Especially in today’s SEC-loving world. But, if Riley and crew can build some sustained success over the last half of this decade, well — it’s clearly a benefit worth pursuing. 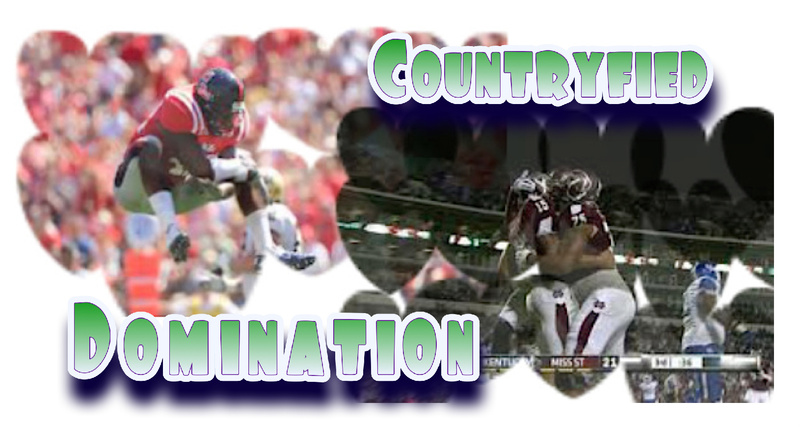 The Magnolia State unleashes an invasive species upon the world of college football. There they were. One week ago Mississippi State and Ole Miss were the toast of every college football fan outside Tuscaloosa and College Station. A look at schedules does not bode well for those hoping the Bulldogs and Rebs get tripped up somewhere in the regular season before a showdown between the two of them inevitably ends the undefeated hopes for one. Ole Miss has Auburn and (maybe) a road trip to LSU to worry about before hosting the Bulldogs. Mississippi State has Alabama. And that’s it. Sure, Auburn and Alabama are as good as anybody to pin your hopes on ending this Magnolia State scourge. But Auburn just got hammered by the Bulldogs. They probably won’t fare any better against the Rebs. Alabama, fresh off its loss to Ole Miss, looked like crap against an Arkansas team still in the process of rebuilding. With just 227 total yards and 14 points against the Razorbacks, Bama fans may be discovering why Lane Kiffin keeps getting fired everywhere he goes. Could one of the Mississippi schools become the fifth team to bring a national title to the SEC so far this century?